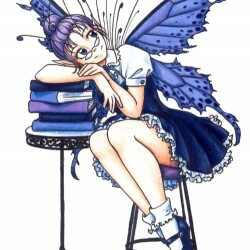 I feel like I've been in a perma-reading slump since ... oh, around the end of the summer. While I've read some books that I've enjoyed over the last few months, there hasn't been one book that's really resonated with me and made me jump out of my seat with joy. Everything's been just okay.As I've written about before, my husband and I are expecting our first baby in early February next year. 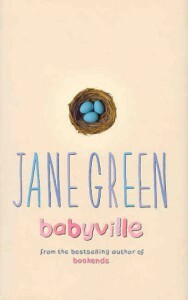 My coworker, who only reads chick lit (and, even then, doesn't read that frequently) picked up a copy of Jane Green's Babyville before heading on holiday in October. She enjoyed it and said it was a good lighthearted beach read. Even though she doesn't have kids, and doesn't intend to have kids, she said that she enjoyed the story and thought that I would too. So I started reading it one Saturday morning ... and then my day disappeared.It wasn't an amazing book (I'm still waiting for my jump-out-of-my-seat-with-joy title), but it definitely sucked me in. The story is told in three parts, starting with Julia who desperately wants a baby and isn't having any luck, which is driving a wedge between her and her husband. Then is Maeve's story, who is fiercely independent and doesn't plan to ever settle down with one guy and definitely doesn't want a baby ... but discovers that she's pregnant after a one-night stand. And finally, there's Sam's story, who's the new mom who's trying to figure out how to balance it all.I love books that involve different characters and different storylines, yet somehow the characters all become connected and intertwined in one another's lives and this book definitely had that going for it. I didn't notice at the time, but Goodreads says that the book is written in present tense, which perhaps boosted its un-put-down-ability. (The only other title that I can really recall reading in the present tense is The Hunger Games, and I remember the writing style definitely contributing to the pace of the book -- when a writer writes in present tense, you're in the moment with the character, rather than hearing the character reflect on what he or she did previously. It definitely creates tension and drama.) I'm surprised that I didn't notice the tense in Babyville, but perhaps that's because I was just coasting along with the fun, lighthearted storyline.So, if you're looking for a lighthearted easy read, this one is definitely one to check out. The same coworker has also lent me a copy of Jane Green's The Other Woman, which I'll be checking out soon ... especially if this reading slump doesn't hit the road soon.